A pink salmon swims into the Whooshh Fish Transportation System on the White River in Washington state. 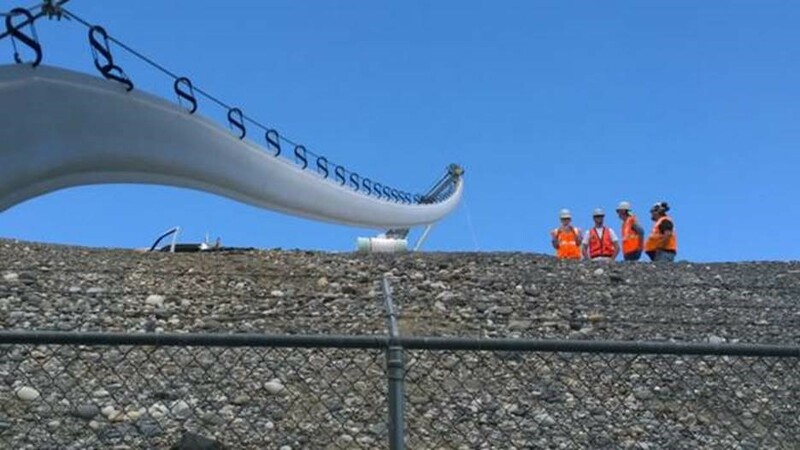 The Whooshh Fish Transportation System is demonstrated at Priest Rapids Dam in Washington state. RICHLAND, Wash. — Enabling fish to migrate past dams could cost a fraction of conventional fish ladders with the help of a new study of the so-called Salmon Cannon, which transports fish through a flexible tube that works by creating a small difference in pressure across fish. The pressure difference helps gently move fish through the tube. The Department of Energy's Pacific Northwest National Laboratory will evaluate Seattle-based Whooshh Innovations' technology, officially known as the Whooshh Fish Transport System, with a $300,000 grant from DOE's Small Business Vouchers Pilot. The company will provide PNNL an additional $60,000 in in-kind support for the study. 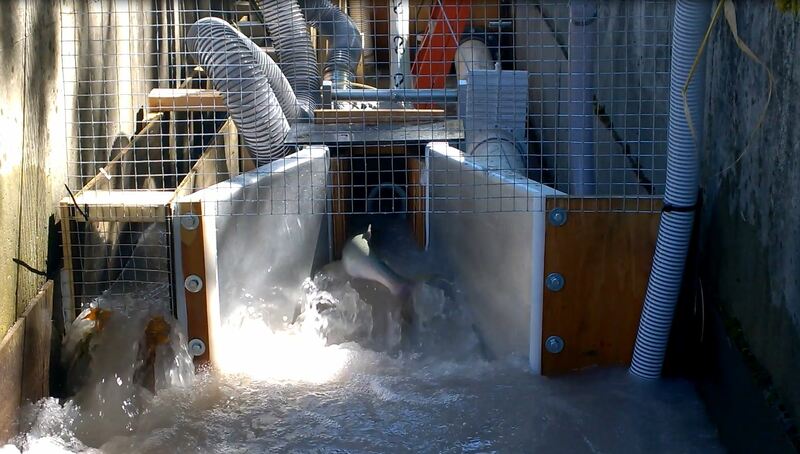 PNNL fisheries biologist Alison Colotelo and her colleagues will compare the performance of the Whooshh system and fish ladders to move Pacific Coast salmon around barriers in the Columbia River. The results could help the technology obtain federal approval to transport Endangered Species Act-listed Pacific salmon around dams. This is the fourth project PNNL has been awarded under Small Business Vouchers, which enables small clean energy firms receive technology assistance from DOE's national laboratory system. PNNL is among five national labs leading the pilot and is specifically supporting small businesses in three areas: bioenergy, water power and buildings. See today's DOE announcement for more information on the Small Business Vouchers program. The full list of all 43 of the winning projects announced today is available on the Small Business Vouchers Pilot website. Pacific Northwest National Laboratory will build on earlier research to evaluate the performance of Whooshh Innovation's so-called Salmon Cannon, which transports fish through a flexible, pressurized tube.